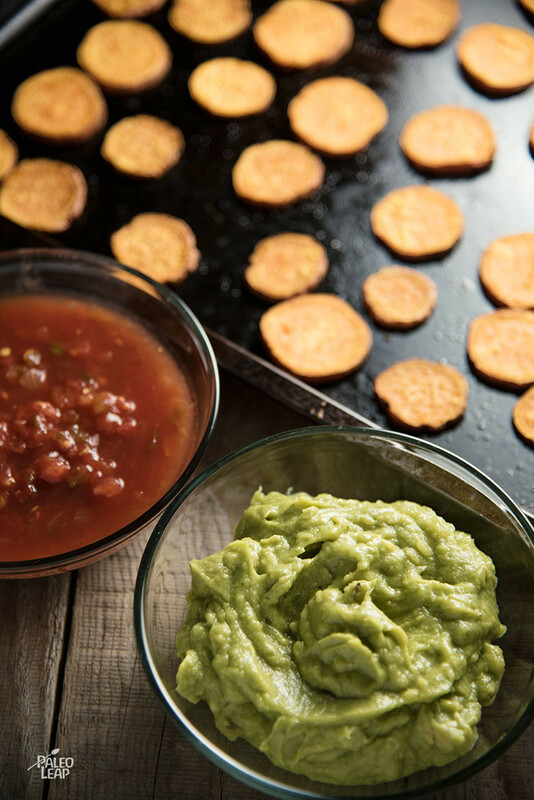 Why choose between guacamole and salsa when you could have both? Roasted sweet potatoes with a light coating of spices work as the base for a pile of guacamole and salsa with just a little bacon on top – no tortilla chips necessary. They taste great, they’re full of nutritional standouts like avocado and sweet potatoes, and they add a cheerful burst of color to any table. Leave the skin on the sweet potatoes for this one; it helps hold them together to make a sturdy base for the toppings. You could also do it without the bacon for a completely vegan recipe. You can use your favorite salsa for this; either make it yourself or get one from the store (salsa is one of those rare and precious prepared foods where you actually can find at least one Paleo-friendly brand in most grocery stores). If you can find a good brand of guacamole, you could also just buy that pre-prepared to save yourself some effort, but guacamole is so easy to make at home that it’s not a huge deal. SERVES: 4 PREP: 20 min. COOK: 24 min. In a bowl, mash the two avocados until smooth. Add all the remaining ingredients for the guacamole. Stir until well combined, cover, and refrigerate. Place sliced sweet potatoes in a bowl and drizzle with olive oil. Sprinkle with chili powder, paprika, garlic powder, and salt and pepper to taste, and toss until well coated. Place the sliced sweet potatoes on a baking sheet and cook in the oven for 10 to 12 minutes on each side. 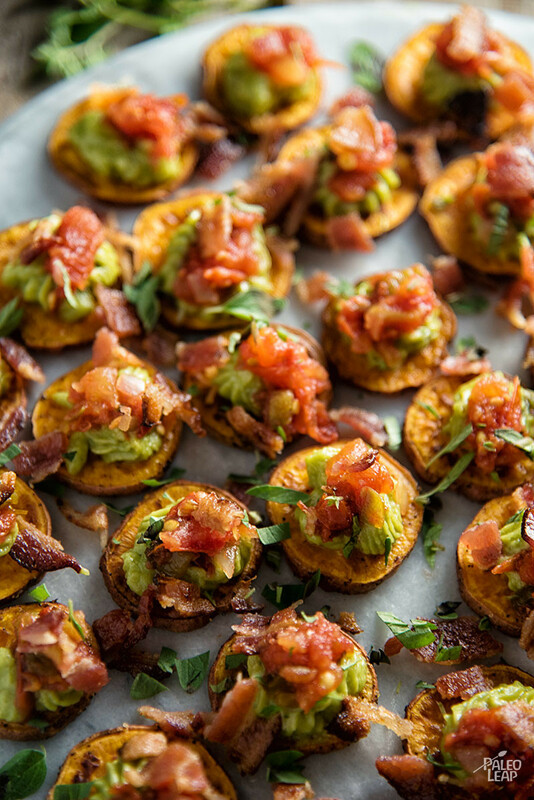 Top each sweet potato slice with guacamole, fresh salsa, bacon bits, and fresh cilantro.